Often referred to as Swimming Cats, the Turkish Van originates from Eastern Turkey, and is associated with the area around Lake Van from which it gets its name. Turkish Vans are quite striking in appearance; stunning auburn (or other colour) butterfly markings crown its head, matched by its beautiful flowing faintly ringed auburn tail, highlighted even so by the chalk white coat that embraces its body. Sometimes additional spots of colour are present on the coat, and legend has it that, as the cats left Noahs Ark and made their way down Mount Ararat into Van, they were touched by Allah as he blessed them, and they carry this Mark of Allah as a coloured thumbprint even still. Traditionally Turkish Vans are auburn/white or cream/white, cream being a dilute form of auburn which is much lighter in colour, however other colours are now quite popular including black/white, blue/white, and the various tortie and/or tabby combinations. Additionally, pure white Turkish cats can be found, known by some as Van Kedi, or just White Turkish Cats. These relatives of the Turkish Vans are much revered by the Turkish people and considered to be the true Turkish cat, especially if they are odd-eyed! Turkish Vans are classified as semi-longhaired cats, which differentiates them from other longhaired breeds like Persians, and although the coat is indeed long its soft silky texture and lack of woolly undercoat allows it to remain unruffled and free from tangles, so little grooming is necessary. 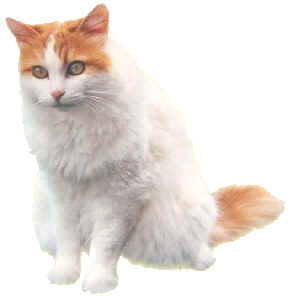 The Turkish Van is a sturdy, muscular cat, weighing anything from 12 to 18 lbs (5 to 8 kg) for a fully grown male. The adult cat will exhibit wide hips and a deep chest surmounted by well-developed shoulders. Its strong neck is encased in a lion-like ruff, and its wedge-shaped head is broad with a strong muzzle. They have large, tufted ears, and oval eyes blue or amber in colour, or possibly even one of each (odd-eyed). Its quite normal to see tufts of hair extending from between their paw pads too, this presumably being due to the harsh winters and snow they have to endure in their native land. Where water is concerned, some are not very keen at all, whereas others may love dripping taps, especially drinking from them, then flicking the water with their paws, or dropping toys into their water bowl. It has been known for Turks to swim in the bath, swimming pool or even the sea. So be warned they may come and join in your daily shower. They may also become curious about toilets, so DON'T LEAVE THE LID UP! The Turkish Van is a loyal, loving and very intelligent cat. Its temperament depends greatly on its upbringing, the amount of human contact and handling it receives as a kitten, and the temperament of the mother herself. They are very affectionate, giving head butts and love bites, but to the uninitiated this could be slightly alarming, but when you get to know your cat you will begin to understand. Turks are often described as being dog-like in their behaviour. They love human company and can be taught a few basic tricks like retrieving toys or paper balls. Unlike dogs though, they love being up high, and will climb on top of cabinets or kitchen units from where they can survey their territory. Theyll also take great delight in relieving those cabinets or shelves of any ornaments or plants that inconvenience them, partly due to their slight clumsiness but often just for fun!